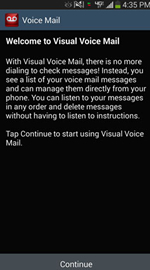 Only Basic Voicemail is available for devices active on prepaid plans. From the setup screen, tap Continue. To continue, review the Terms and Conditions and then tap Accept. 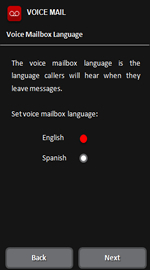 Tap a Voicemail language then tap Next. If presented, enter the voicemail password then tap Next. 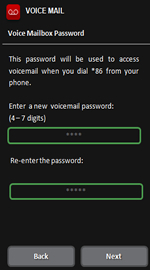 The Visual Voicemail password is the same as the standard Voicemail password. 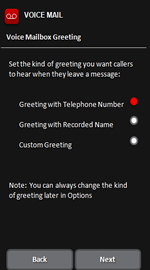 For assistance with resetting the password, refer to Reset Voicemail Password. The password can't have repeating or consecutive digits (e.g., 1111, 1234). Tap Record to record a name then tap Stop. 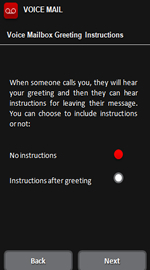 Tap Record to record a custom greeting then tap Stop.